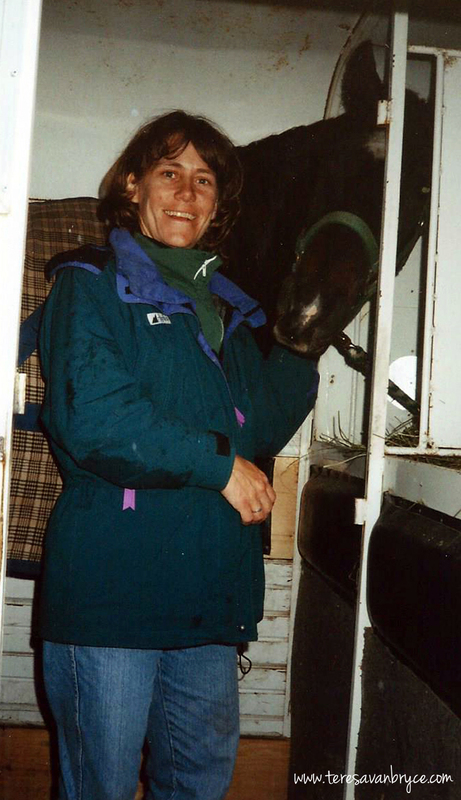 In 1990, I embarked on a grand adventure, one that would take me away from Echo and all things horse, a nine-month journey of the South Pacific—Fiji, the Cook Islands, New Zealand, and Australia. I couldn’t afford to travel and keep a horse so Echo was leased while I was away. The young woman who’d leased him had enjoyed every moment and was keen to have me come to watch her in what would be their final competition together before he was returned to my care. He looked fabulous—fit, shiny, and ready for the show ring. I couldn’t resist taking him for a short ride before she tacked him up and below is one of my favourite photos of the two of us, a black & white taken by my Australian friend Matthew who was visiting Canada. One of their classes that day was some type of hunter class that included a flat walk, trot, canter in the arena before lining up to go over the small course of jumps. When the announcer called for them to line up, Echo and Emma settled into a spot at one end of the line of fifteen or so horse/rider teams. I crossed my fingers and chanted to myself, “Start at his end. Start at his end.” It was not to be. They started with the team at the other end which meant Echo would go last. 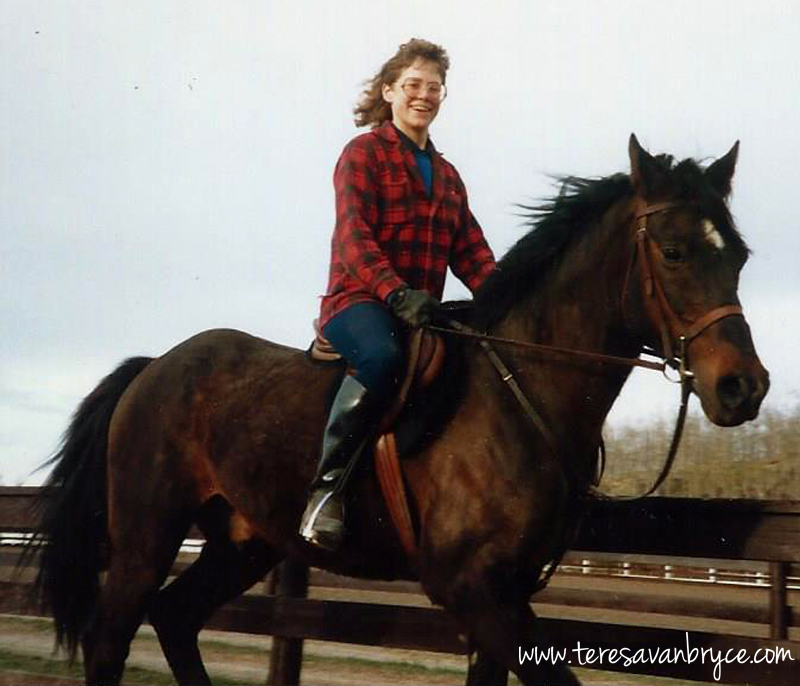 Known for his bravery, his spirit, and his energy, but not his patience, by the time the first few riders had ridden the course Echo was restless, by the halfway point he was spinning, stamping his feet, and causing enough of a ruckus that Emma had to take him out of the arena. I went outside to help her calm him down but, to no avail. When it was finally her turn, he careened around the ring, knocking fences over left and right. He was such a courageous and clean jumper when he was calm, but a complete disaster when he was worked up. He loved it a little too much and was reckless in his enthusiasm. 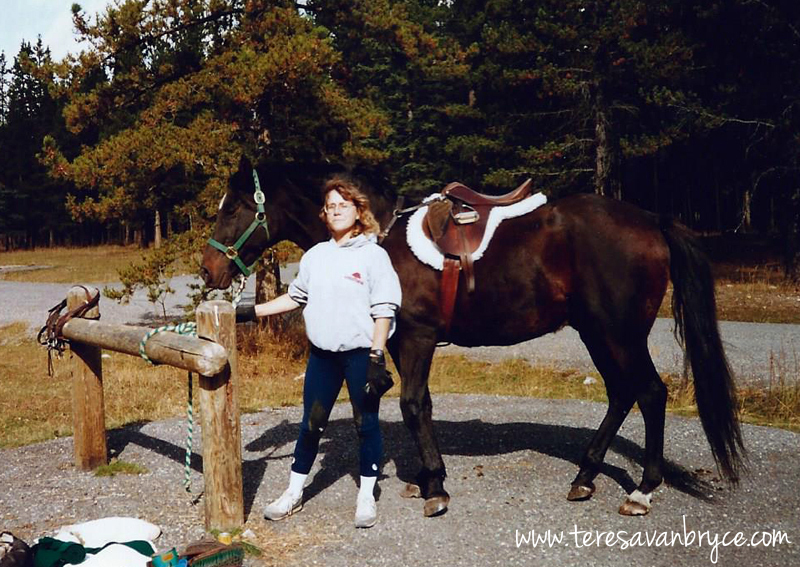 After my months of travel, I was feeling distanced from my life with horses and made the decision to sell Echo. I placed an ad, a few people called, and one of the callers came out to ride. He was a big man, rough with his hands, and when I saw him up there on my lovely boy I changed my mind. He wasn’t for sale. I no longer had an interest in competing but it didn’t mean I couldn’t keep Echo, who was now sixteen, and would probably appreciate a more relaxed, recreational life anyway. 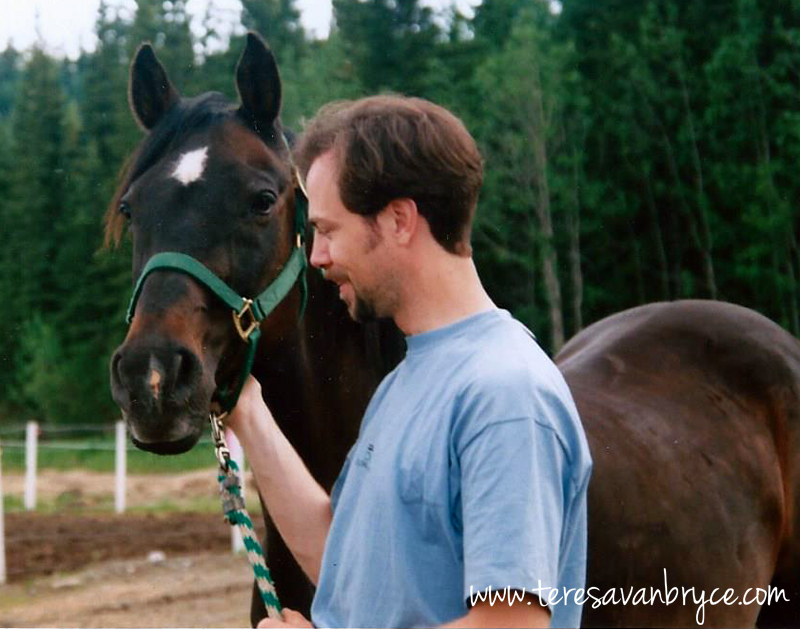 After a short stay back at Calta Stables, I found us the perfect “retirement home”, in Bragg Creek, not far from the place he’d lived when we first met. They called the stable Hooves, Etc. due to the variety of animals Sue and Wayne kept on the place—horses, miniature donkeys, llamas, goats, pigs, a rescued Greyhound and an enormous Irish Wolfhound. Getting ready to hit the trail at Station Flats in Kananaskis Country. Echo was home. He loved it. His pasture was huge, he had a big herd to boss about, and our time together went from competitions, lessons, and arena work to trail rides through the foothills on weekends. Other than a trip to the equine dentist for a condition called wave mouth, he was a happy, healthy boy. In 1996, he met and gave his approval for the man who would become my husband the next year. Life was good for both of us. Giving his stamp of approval in 1996. Our only event over those eight years at Hooves, Etc. 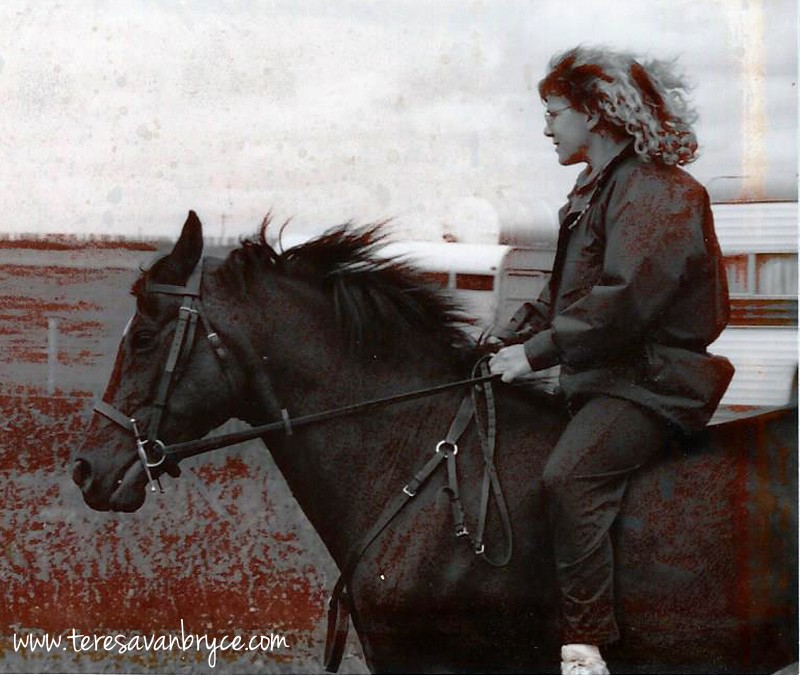 was a foray into natural horsemanship at a Chris Irwin clinic when Echo was twenty-four. The other participants were so impressed at how good he looked for his age. That was in May of 1999. On our way to the Chris Irwin clinic in 1999. In July of that year, I took Echo for what would be our last ride. Sign up for my monthly eNews and receive a free ebook!